St. John Ambulance will be working at the match venue during competition matches to ensure that any injuries or accidents are attended to. 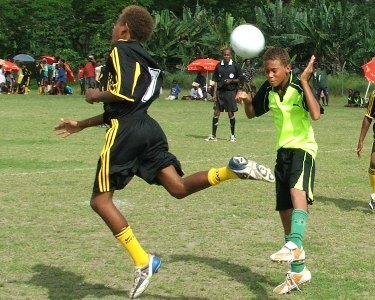 In addition, they will set up a medical centre at the kids football festival games village. This is purposely to provide on site medical care for any sick students. Up to 4 medical personnel will be present for the matches and the medical centre at the games village will be manned by 2 staff each evening from 6:00pm to 9:00pm. A representative of St. John Ambulance, Roy Oeta, said that his organization is very thankful that SIFF has given them the opportunity to support the kids football festival. “St. John Ambulance has not been very active since the ethnic conflict in Solomon Islands so this is the ideal chance for us to promote ourselves to the public again,” Oeta said. Chairperson of the kids festival organizing committee, Phillip Ohoto’ona, said that St. John Ambulance will play an important role during the event. “The organizing committee looks forward to working with St. John Ambulance. The service they provide is an important component in looking after the welfare of the participating kids,” Ohoto’ona said. The kids festival organizing committee has also asked St. John Ambulance to contribute to the evening education programs at the games village. “There is a special opportunity being created here for St. John Ambulance to educate the participating schools about applying first aid, helping drown or burn victims and other accident related health issues,” Ohoto’ona said. Oeta has indicated that St. John Ambulance will be able to assist with the education programs for the participating children. This is the first event in a number of years that SIFF has engaged the services of St. John Ambulance.